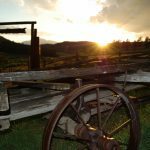 When packing for your vacation at Elk Mountain Ranch, you will need to keep in mind two main things – comfort and Colorado weather. As a native New Englander, I was accustomed to the mood swings of Mother Nature and the need for layers, but out West things seem to be a bit more extreme. On the plus side, there is very little humidity and most days are absolutely beautiful. Mornings start off cool and refreshing, sometimes with fog that burns off quickly once the sun comes up. The walk to breakfast may require a heavier weight jacket or sweatshirt, but by the time you have finished your coffee and are ready to hit the trail, it will have warmed up significantly. Temperatures can go from the high 30s to mid-70s and back again in a matter of hours. A quick rain storm may roll through, lasting a few minutes, before the sun is out shining again. The best advice is that layers are your friend, and try to be prepared for any conditions. For those visiting in late May/early June and during the adult-only weeks in September, pack additional layers for the colder evenings – including light gloves and a winter hat. Pants (jeans) are highly recommended for trail rides – they protect your legs while on your horse, and have an added bonus of protecting you from the sun. Colorado has very little humidity, so wearing pants in summer is actually quite doable. 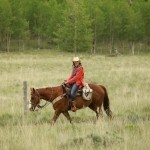 Depending on the length of the trail ride, you may experience a range of weather. It is easiest to have multiple layers for your upper body and switch as needed (off of your horse of course! ), storing extra shirts or a light rain jacket in your saddle bag. 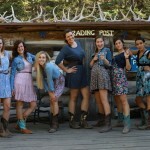 Cowboy boots are also great to have – not only do they get you into the Western mindset, but they are practical. Tom will go into greater detail as to why, but suffice to say, cowboy boots were designed with stirrups in mind, providing for an easier riding experience when compared to hiking boots or athletic shoes (hint: it is all about the heel). If you are purchasing new boots for your trip to Elk Mountain, it is a good idea to break them in beforehand! And don’t worry about getting them dirty – they will see plenty of dust in the arena and on the trail. Aim for comfort over fashion – I am a runner with bad feet, so a comfortable pair of cowboy boots with longer cushioned socks was essential. Personally, I have found that the Ariat brand is the New Balance of western footwear (super comfortable), however, like running shoes, each person has their brand that works best for them. Additionally, the ranch has a large selection of boots that you may borrow for the week, with various sizes and styles available for children, women and men. Colorado gets an average of 300 days of sun, and, due to the high altitude, those Bluebird days result in stronger sun exposure than you may experience other parts of the country/world. Pack plenty of sunscreen, hats, sunglasses, and clothing that will help protect you from the sun. Shirts with a UPF rating (typically lightweight hiking/travel shirts) are great as they provide coverage as well as breathability on hot days. Also consider increasing the SPF you use. For example, when I lived in New England and would visit the ocean, I would use 30 SPF on my face and 15 for the rest of my body. In Colorado, my go-to sunscreens are now 50 SPF (face) and SPF 30 (body). 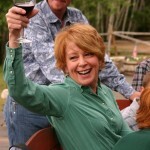 You may also want to pack for the variety of activities that occur on and off the ranch. Bathing suits are essential for the hot tub, as well as for white water rafting and visiting the hot springs. If you do go rafting, it is recommended that you wear non-cotton clothing (athletic wear that wicks work best). The rafting company also provides additional wool layers for those brisk days. 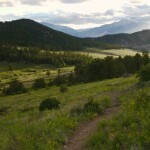 EMR is surrounded by the San Isabel National Forest, and it is a great place to explore on your own two feet. Guests enjoy going for a walk, run or hike along the dirt road and on the many nearby trails, so pack appropriate clothing and footwear for these activities. 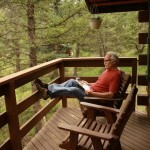 Time at the ranch allows you to disconnect, so this is the perfect opportunity to bring that book you have been meaning to read. There is also a library in the lodge where you can borrow a book for a week, take it with you if you aren’t finished, and leave behind a book for another guest to discover. With so many scenic views near the ranch, you may consider packing your camera to capture those moments. Nothing quite beats a spectacular Colorado sunset framed by the Collegiate Peaks, especially from the top of Futurity Hill. Afraid that you are packing too many clothes? Self-service laundry is available on-site, making it easier to do a quick load of wash during your down time. Finally, while EMR is all-inclusive, it does not have a liquor license so you will need to BYOB if you would like an adult beverage during your stay. The van from DIA will make a stop if needed, and you can always make a request for supplies during one of our town runs.